If broken, chipped, gapped or stained teeth are suppressing your smile, we want to help you beam with confidence. At QVC Dental Baldivis, we can help you make over your smile with veneers. These wafer-thin tooth coverings are custom-created to fit your teeth and address your particular condition(s). Composed of durable porcelain, veneers are affixed directly to the tooth surface. 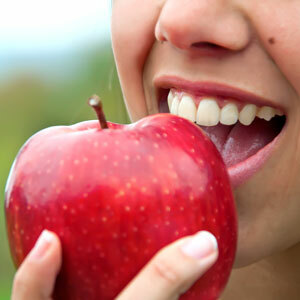 The result is a smile that’s whiter, brighter and overall more aesthetically pleasing. Before we can begin the process of creating veneers for you, we must first ensure that your teeth and gums are healthy. We invite you to schedule an evaluation so we can determine if you are an ideal candidate for veneers. If your dentist determines that you are a suitable candidate for veneers, we’ll begin a straightforward, two-step process. On your first appointment, impressions will be taken. An Australian-based technician then will utilise the impressions to fabricate customised veneers. Rest assured that the veneers will be colour-matched to your existing teeth and look entirely natural. When you return for your follow-up appointment, we will affix the veneers to your “smile teeth” using a strong adhesive. Because your veneers will be bonded in place, it’s important to take care of them as you would the rest of your teeth. Be sure to practice good oral hygiene habits such as brushing at least twice a day, flossing daily and scheduling regular checkups. If you take good care of your veneers, they can last for a long time. If you’re tired of putting up with a lacklustre smile, contact the practice today. With our high-quality veneers, you can achieve a glorious, gleaming smile that you’ll be proud to show off!